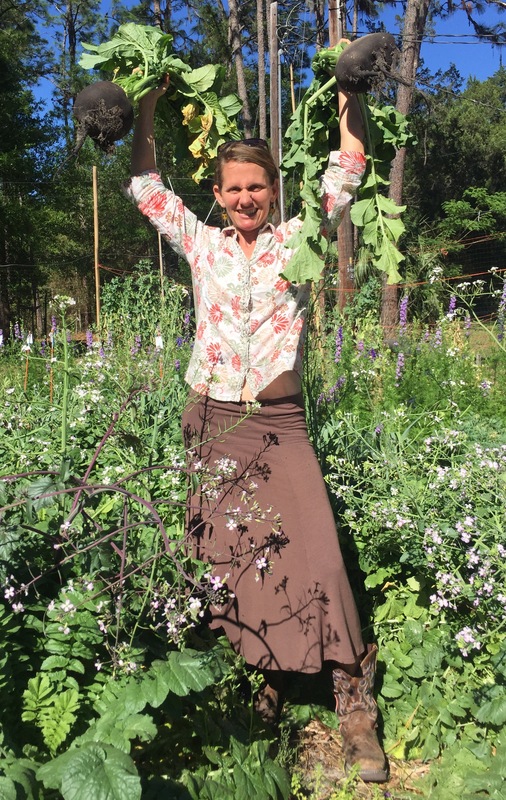 Recently, our organization Working Food had the honor to partner with Guts & Glory GNV to bring storytelling and the love of food and gardening together. I elected myself as one of the storytellers, figuring it would be easy enough to come up with something on the theme, and helped Anna think of who else would be good to recruit. As the time came closer and closer to present, I started feeling….I don’t know… not nervous, not afraid. Vulnerable? While I speak in front of people all the time teaching classes and workshops, making announcements, and giving talks; this was very different. This was little me in front of a lot of people, some of whom I know and many I don’t, basically sharing my blog in spoken word. Very different. It was choppy sometimes when I rehearsed, forgetting some parts that connected to the next piece, and I was crying every-time I practiced it in front of someone. But I’ve done much harder things, and know that challenging life experiences are good and should be accepted. I was honored to be onstage with 4 other storytellers, 3 of which I consider close friends and respected individuals that have enriched my life. It was a magical evening and the positive feedback we felt from our community felt really awesome! I was grateful for my husband to be there and share the experience, and for Maya yelling out “We love you Melissa!” when the tears came on stage and I needed the change of focus for a moment to catch my breath and begin speaking again. So here it is, what I shared publicly about how gardening and my life have been so interconnected and inseparable over the years. On Memorial Day, in the midst of sub tropical storm Alberto, I was in the garden pulling up elephant garlic. It was an emergency harvest, otherwise I would have been enjoying the storm at home with a cat on my lap, and a good book! The weeks of non-stop rain with no end in sight, meant that my precious bulbs planted 7 months ago, might rot in the wet soil. I worked in solitude under a deluge of rain bands, that periodically lifted, so that I too could lift back my rain hood to hear again, and feel air on my skin. It’s stifling and noisy under a rain jacket in Florida. I worked for an hour pulling up the sturdy and large roots and leaves, along with the soil they had bonded with over the past 7 months. Up with them also came lots of earthworms that were woven among the roots, now wriggling to escape the light and my hands. One garlic root system was connected to a neighboring bright orange cosmo flower. I had to perform careful surgery to extract the two without causing harm. I was surprised by the the large holes left behind in the earth after removing the giant bulbs. I thought about the large holes I’ve felt in my life when someone I love has left me, or hurt me. Eventually it heals over, just like the soil and worms that fill in where the garlic once was. I thought about all the connections I have with people and animals that run deep and interconnected, like the cosmo and garlic roots that shared space with earthworms. I’ve learned a lot about my life in the garden, and have found her to be the very best therapist. Her beauty, life force, surprises, disappointments, and heartaches have helped me process profound life experiences. But most of the time, she allows me to simply be consumed by only that which is in front of me. A rare treat in today’s busy world, pulling from all directions. There is a reason horticulture therapy is a legitimate occupation and practice that heals people. 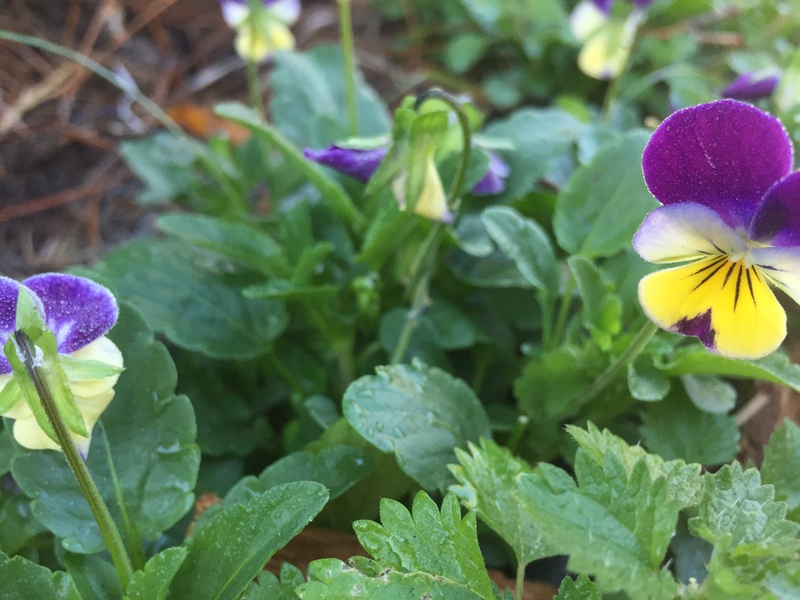 Johnny jump ups are dainty little purple violets, that grow in my garden every year. Planted from seed years ago, they jump up wherever they please year after year. They are a welcome visitor each fall, not only for their beauty and ease of care, but because they remind me of the alleyways they sprawled out into in my childhood; my mother and I returning with trowels to dig up a few for the garden at home. Her affection for the pretty little flowers has stayed with me all these years. I have a couple tattooed on my arm. She passed away 8 years ago, she was only 51. Still bright, vibrant and full of life, she was gone, just like that. She was my best friend, yet someone I didn’t fully know. Grief has a way of grinding your life to a halt, and in my heartache I desperately wanted everything else to just stop along with me, giving me the time and space to process my grief and this new life without her in it. But every November when I’m on my knees in the garden, planting garlic cloves in neat little rows with 12” spacing, and I look to the sky to greet that first wave of sandhill cranes trumpeting their arrival, I am reminded of the tremendous life force that keeps on going. Despite difficulties and setbacks, the cranes keep migrating, and the plants keep growing. I keep returning to the garden with my dreams, my troubles, and all of my awesome seeds. For a seed to achieve its greatest expression, it must come completely undone. The shell cracks, its insides come out, and everything changes. To someone who doesn’t understand growth, it would look like complete destruction. As SeedEO of our little non-profit company Working Food, I can attest to the power of the story of a seed. I am fascinated by them, and immersed nearly 365 days a year in them. I grow, gather, clean, store and share them with anyone who needs them. I spend a lot of time studying them, and staying up late at night writing grants to find money to protect them. I venture out into tropical storms to save them from ruin. In short they have control over me, and I some control over them. Which is how plants and people have always worked together. We need them as much as they need us. This is how most relationships, functional ones anyway, seem to work. I feel that way about my closest friends, my husband, family. A mutual relationship where one gives what the other needs and so it goes round and round; we are better together. Monarch butterflies are one of my favorite garden visitors, because like Johnny Jump Ups they remind me of mom. Each time one flies past, it’s a celebration, a moment of pause to remember someone I still love. I have a couple of those tattooed on my arm, too. They will always share the garden with me, along with the hundreds of other pollinators I adore, because there will always be flowers for them. Like Johnny Jump Ups and Cosmos. I think what fascinates me most, aside from their beauty and memories they conjure, is the great process of metamorphosis they undergo in their short life. On occasion, I am fortunate to notice where the caterpillars have crawled off to pupate after their assault on my plants nears an end. Wendy taught me to always plant a row for the hungry, and it’s part of my garden protocol to share. The pupa stage which seems inactive and often goes unnoticed by most of us, is a fascinating process. 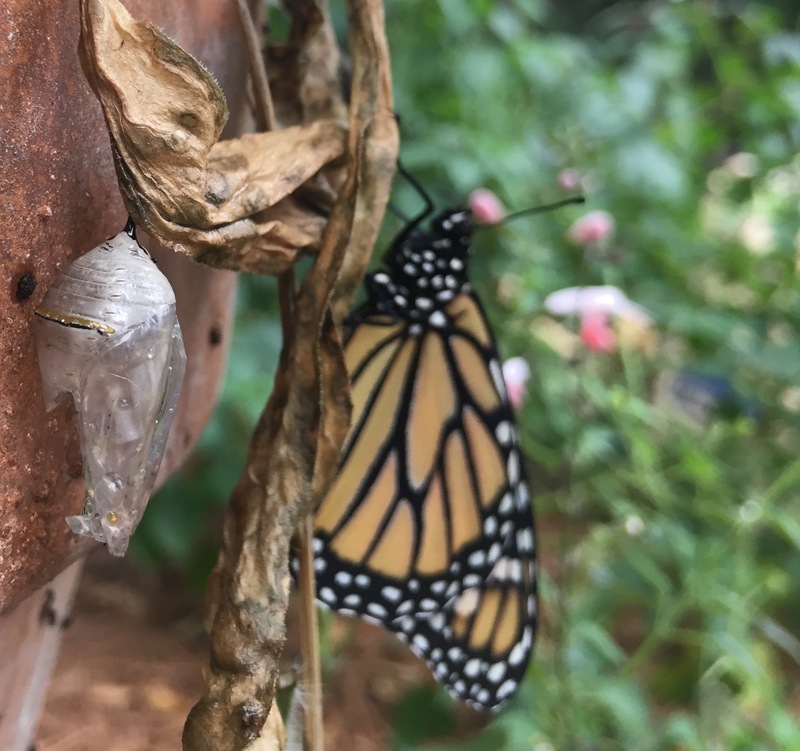 Inside the little pupas, some of which look like jewels and some disguised as bird poop, a slew of chemical and physical changes are bubbling inside, as cells reorganize and rebuild for their new life ahead. The new butterfly is now a creature of noticeable beauty with the ability to ride the air currents in search of food and mates, and go on great migrations. They are no longer confined to a particular plant in a particular place. They are free. I had an incredibly metamorphic experience about 6 years ago, when on June 27, 2012 I heard the dreaded words, “you have cancer”. In the process, I learned to accept the things I couldn’t change as I entered this new phase of life; while tackling head on and with honesty and compassion for myself, the challenges that I was able to address. These were my own cells in my own body undergoing change. I knew I would re-emerge in some way, and so I couldn’t dwell on the injustices and unknowns of the situation. I could only lean in, learn, and hope to grow stronger and more beautiful because of it. I was fortunate to make it out alive, with a fresh perspective and as a better person. My cancer experience was a really fucked up way for life to offer me the gift of metamorphosis. I’m grateful for this gift however, and for how it transformed me. I wonder though, if the two friends I lost recently to cancer felt the same. Life can be so damn messy and heartbreaking. Gardening is no different, but it is there I get to grieve, heal, and rejoice. I wish sometimes I had the perfect and tidy garden! One with clearly defined walkways heavily mulched with wood chips. Neatly weeded and planted rows. A garden free from the threat of a devastating frost or a deadly disease. Where no army worm outbreaks happen, and armadillo invasions aren’t a thing. Like the picture perfect garden on the cover of a fancy garden magazine. But the reality is that most of the time, the garden is in some transitional and messy phase. I’ve stopped apologizing for the disorder when visitors come. Instead, I point out that brown and dead-looking plants are actually loaded with life-giving seeds. That the chewed up, ragged fennel plants just recently had caterpillars feasting on them, and soon we would have swallowtail butterflies. That the empty and upheaved rows once grew beautiful garlic, that were roommates with earthworms, and propped up the cosmos. This is the real life garden with hard yet beautiful life lessons, a sympathetic ear, and much to admire and share. This is the garden I will proudly pose in front of, when I’m on the cover of Southern Living or Garden and Gun one day. Thank you! They are all from my own experiences. Thank goodness for smart phones, they aren’t all bad!